I’ve travelled around in lots of different ways but to date, I’ve never done any kind of volunteer travel. (I’ve volunteered while I’ve been living somewhere, but not gone anywhere specifically to volunteer.) I will one day for sure – if not before then definitely I can see myself wandering the world in my retirement years doing all kinds of helpful things – but it was really interesting to talk to travellers who’ve already done various kinds of meaningful volunteering on their travels. I’d love to hear about other people who’ve done some volunteer work around the world so let me know in the comments or hop into our Thoughtful Travellers Facebook group and share some of your experiences. You might just be able to get the best of both worlds by travelling around the world and helping people by volunteering. 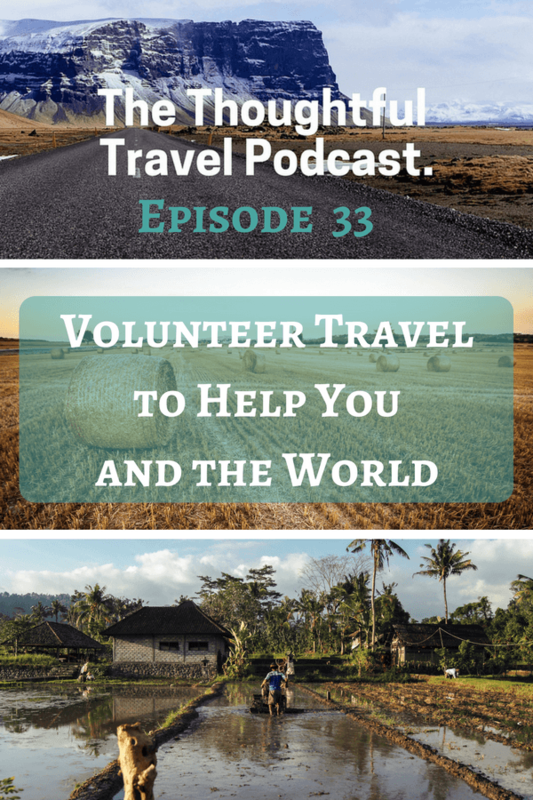 It’s not always that simple, but in Episode 33 of The Thoughtful Travel Podcast I talk with three guests who have volunteered across several continents with a huge variety of organisations. First up, I chat with Serena Star-Leonard who started off a project to create videos of great projects in a school in the slums in northern Colombia – in a place where most taxi drivers refused to take them. Working with animals instead of kids, I then talk to Diana Edelman who spent several years helping out at Elephant Nature Park in Thailand, a place that now gratefully accepts volunteers for short or long stints and does amazing work helping elephants. Finally, we move to agriculture with Audrey Wanders and her discussion of WWOOFing around the world and her experience of volunteering on organic farms, and wanting to do more. Voluntourism – thank you for addressing that!! It does annoy me how trendy volunteering is at the moment but thankfully people are also increasingly addressing the issues around volunteering, e.g. short stints to make little to no impact to the actual community but “benefit” the volunteer. I’ve heard of WWOOFing but not sure what I think of that. Probably depends on the type of work but wouldn’t it mean a lot of “induction” on the farmer’s part? Unless you’ve got experience working on farms, I’d imagine that there’d be a fair of time showing volunteers the ropes?? Or am I not understanding what WWOOFing means? Yes – it’s not just as simple as showing up and thinking you’ll be able to help out, is it! But lots of people don’t realise that yet. Trying to do my bit there! I don’t know much about WWOOFing either and I agree it probably depends on the situation, but I assume that at least some of the time there’ll be quite a lot of fairly mundane/menial tasks to do where some extra hands probably do actually help – but I’m just guessing and vaguely basing that on hearing from others’ experiences. I’d rather do voluntary teaching or something like that myself – use my strengths!